The authors of a recent study in the journal Phycologia tested the influence of UV brightness on macroalgae photosynthesis. The researchers found that when photosynthetically active radiation was not present, UV-A elicited photosynthetic carbon fixation rates in every species they tested. Phycologia – While it is fairly well-known that some macroalgae can use ultraviolet light A (UV-A) for photosynthesis, researchers Juntian Xu and Kunshan Gao tested the magnitude of this phenomenon on a range of red, green, and brown seaweeds. The pair observed that when photosynthetically active radiation (i.e. the white light in our visible spectrum) was not present, UV-A elicited photosynthetic carbon fixation rates in every species they tested. The authors of “Photosynthetic Contribution of UV-A to Carbon Fixation by Macroalgae” worked to find the influence of UV brightness on macroalgae photosynthesis. The most important discovery in the article, according to author Juntian Xu, is that “solar UV-A alone can trigger photosynthetic carbon fixation of macroalgae, which is true for all the species tested across green, red, and brown algae.” These findings were consistent across each species of macroalgae they tested. The positive impact of UV-A radiation can be huge. For example, UV-B radiation negatively impacts organismal growth, communities, and, more specifically, photosynthetic processes. Ultraviolet light A does nearly the opposite, as long as it is at a moderate level. It can even repair damage caused by UV-B radiation. To arrive at these findings, the team studied photosynthetic carbon fixation and O2 evolution with only UV-A present. The range of eleven macroalgal species, all from Nanao Island in China, was tested and gave varying photosynthetic rates. The gross ratio of UV-A to photosynthetically active radiation was as much as 22 percent. Algae and cyanobacteria are vital to aquatic ecosystems because they produce approximately 50 percent of the photosynthesis in their environment. However, macroalgae, which are also important to the carbon cycle, live in shallow waters and take in direct solar and ultraviolet light. This prompted the researchers to take a closer look at the positive relationship between macroalgae and UV-A, which yielded consistent results. Full text of the article, “Photosynthetic Contribution of UV-A to Carbon Fixation by Macroalgae,” Phycologia, Vol. 55, No. 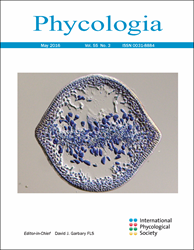 3, 2016, is available at: http://www.phycologia.org/doi/full/10.2216/15-91.1.